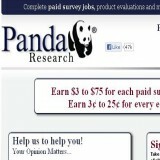 Panda Research pays on a cash basis when you reach $100 by check on surveys that do pay out. The surveys you do manage to complete require you to sign up, before you get credited, for offers that cost money – some even on a monthly basis! Some offers are products on a trial period and you have to cancel quickly, or face full value charges. However, even this becomes a challenge with Panda Research. They have you jumping through their hoops to cancel so as to confuse and tire you out in hopes you give up and just pay. One customer says they were still being charged even though they cancelled. Be very careful on using your own email account. Create a different one than your usual because Panda Research will swarm you with tons of spam emails every day! There is another huge issue I considered when taking their one to two dollar surveys. Making the hundred dollars to cash out will only frustrate you because you have to worry about canceling so many offers before they start charging you that you will ultimately forget about three or ten and this turns into a money pit. Even though it is free to join Panda Research, I am going to call this one a scam because of the money you will lose by paying out on all these offers they make you sign up for that charge you money. The hundreds and hundreds of complaints I’ve read also indicate this to be a scam, as other paid survey sites I’ve reviewed have way less unsatisfied customers commenting on their bad practices. This one takes the cake and is giving panda bears a bad name. Do not waste your time on this terrible service, for fear of losing lots of money instead of making some.